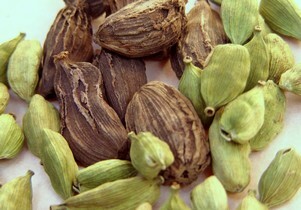 Cardamom is also known as Chhoti Elaichi in India. It is a highly valued herbal spice that is used as a culinary agent in Asian cuisines because of its intrinsic flavoring capacity. Moreover, when used as a home remedy it helps cure various ailments like indigestion, nausea, lightheadedness, etc. This aromatic spice is straw-green to bright-green in color with small, black seeds inside a pod. The fibrous, oval pod has about 8 to 16 seeds. There is another variety of this herb, that is, Black Cardamom or Cardamomum amomum which is mostly found in Asia and Australia. 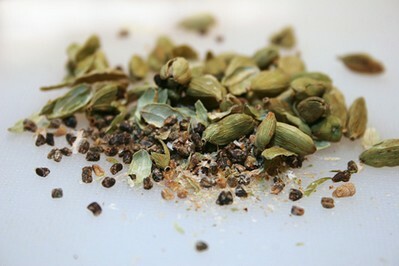 Cardamom is the third most expensive spice in the world and is considered as the “Queen of Spices”. The seeds have a sweet aroma and slightly pungent taste. Its essential oil is obtained by steam distillation of cardamom seeds. The oil and left over resin is used in processed foods, liqueurs and perfumes. This herb is native to Southern Asia, distributed from Southern India to Sri Lanka. It is also grown in Vietnam, Thailand, Guatemala, Laos, Costa Rica, Tanzania and El Salvador. The perennial bushy herb originally came into existence in the monsoon forests of the Western Ghats in southern India. It is a tropical herb plant that belongs to the ginger family Zingiberaceae. Cardamom has digestive, antispasmodic, carminative, anti-inflammatory, anti-microbial, aphrodisiac and diuretic properties. It boosts digestion and stops nausea, vomiting. Plus, the herb aids in eliminating belching and flatulence. Some other health benefits of cardamom (Elaichi) include relief from stomach pain, colon spasms (caused by ulcerative colitis) and menstrual cramps. Besides, application of cardamom oil cures teeth and gum infections. Its pleasing fragrance removes bad breath (Halitosis). Furthermore, the herb works as a mild circulatory stimulant. This warm spice improves blood circulation to the lungs. Plus, it can help lower blood pressure, especially in case of primary hypertension. The therapeutic herb also promotes urination and aids in detoxification of the body. Cardamom (Elaichi) benefits the immune system as well. In addition, studies show that it has antioxidant properties that can increase the levels of glutathione (a natural antioxidant in the body). It is also believed to have antitumor qualities. Cardamom essential oil has a balsamic aroma and expectorant qualities. Thus, when used in aromatherapy, it helps break up mucus and congestion in sinuses and lungs. It is also beneficial for those suffering from asthma or bronchitis. It has a soothing effect on muscles, nervous system and gives mental clarity. It is high in phytochemical cineole, which is a central nervous stimulant. Further, the herb’s diaphoretic properties are useful in increasing perspiration. Moreover, cardamom or Elaichi is a good source of potassium, calcium, magnesium, iron and manganese. Its pods contain essential volatile oils. Plus, they are rich in vital vitamins like riboflavin, niacin and vitamin C.
This digestive medicinal herb is used in rich curries. In Indian, Arabic, and Scandinavian desserts, it is used for flavoring. Plus, cardamom is also included in Danish pastry making to increase the aromatic sense of sweetness. It can be added in grape jelly, applesauce and fruit salad too. When added in coffee, it helps detoxify the caffeine in it. 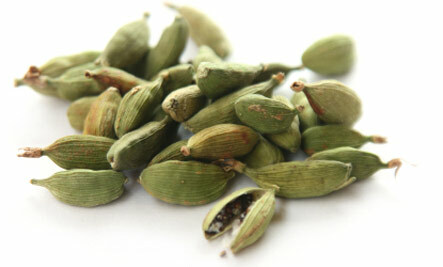 In addition, cardamom seeds can simply be chewed as mouth freshener after a meal. Moreover, it is used in certain rituals and ceremonies as well. Interestingly, it has been a popular ingredient of old-time love potions too. 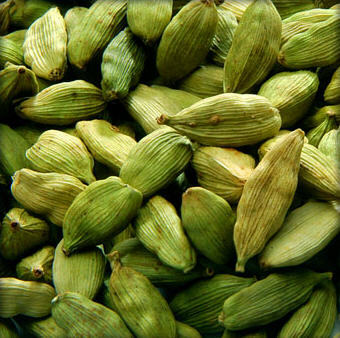 • As already mentioned, cardamom works as a great digestive tonic. You can prepare a natural cure with this herb by mixing cardamom, ginger and fennel seeds, taken in equal quantities. Add one teaspoon of this mixture in a cup of water and put a pinch of asafoetida in it. Take this infusion to get rid of abdominal gas. • If you are searching for cardamom home remedies for indigestion then you need to make a mixture of one teaspoon each of cardamom and fennel seeds. Crush this mixture and add a quarter teaspoon of the resultant powder in a cup of water. Drink this solution two times in a day after having meals. • Gargling with an infusion of cinnamon and cardamom helps in the natural treatment of Pharyngitis and Sore Throat. • Inhaling cardamom essential oil used in a steamer can reduce cough, cold and congestion. • Consumption of one tablespoon of honey mixed with some cardamom seeds can improve eyesight and reduce nervous weakness. • Cardamom benefits also include relief from headache caused by indigestion. You just need to have cardamom tea to get rid of this problem. You can prepare this herbal tea by steeping a quarter teaspoon of powdered cardamom seeds in boiling water for about 3-4 minutes. It helps deal with issues like depression, exhaustion and stomach acidity as well. • Mix equal amounts of dried ginger, licorice, cardamom seeds and crush it to make a fine powder. Have a teaspoon of this home medicine along with honey to cure oral infections and toothache. • Intake of lemon juice mixed with some sugar, and a pinch of cardamom powder is highly beneficial in dealing with dizziness and lightheadedness. • Taking a combination of five drops of cardamom tincture and 15 drops of gentian tincture serves as one of the best cardamom home remedies for increasing appetite. Follow this natural cure three times in a day. • (Elaichi) cardamom benefits patients suffering from celiac disease because it helps combat the effects of gluten intolerance, to some extent. When used in excess, cardamom tends to increase the secretion of gastric acid, hence interfering with the digestive system. Moreover, it is not considered suitable for individuals suffering from gallbladder disease. Those who have ulcers should not take this herb too often. Besides, it is believed that overuse of cardamom increases the risk of impotency. Though not common still, some individuals can develop allergic contact dermatitis due to terpenes present in cardamom seeds. As this aromatic herb is quite expensive in certain countries, people often look for cardamom substitutes. Thus, you can try substituting green cardamom with brown cardamom, ground cloves, cinnamon, nutmeg, mace and other similar spices with strong fragrance. Cardamom benefits when it is taken in moderate amounts. Nevertheless, as there have been no trials with this herb (on humans), pregnant and lactating women should be cautious while taking it. I feel very good, my headache is gone. It’s just amazing, I love it. This(elaichi) tea is the best tasting & effective tea I’ve ever had! I wonder from where in South Africa(East London) can I get/buy it?